Meal Planning with "Reinvention Recipes"
You know the drill. You start the week with the best intentions, with visions of Brussels sprouts gracing the table on Tuesday, that winter squash lasagna you’d tagged on Pinterest on Wednesday, and so on. You remember the 4:30 dentist appointment you’d forgotten to write on the calendar. You’ve got to squeeze in onnneee moooorre hhhoooour to hit that deadline. And before hump day hits, all your healthy, unprocessed visions have dissolved like cotton candy. We’ve all been there. We all are there. The simple truth is, processed food is easy — grab and go, dump and stir — and real food takes time to prepare… especially if you’re starting from scratch every night. So we’ve got to be proactive about making unprocessed food easier to fit into our lives or we’re overwhelmingly likely to give in to the path of least resistance. Now here’s the good news. I’ve found a way to stack the odds so that the way you want to eat becomes the path of least resistance, rather than the other way around. 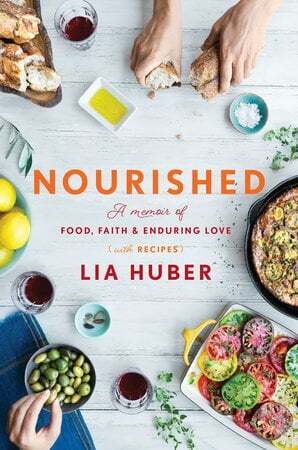 As a food writer and recipe developer for major magazines, and as the founder of NOURISH Evolution, I knew how to eat. I’ve written hundreds of healthy recipes any of which I’d be psyched to make on any given night. Yet most of the time I didn’t, simply because life got in the way. You know what I’m talking about. You’ve read Andrew’s awesome primers on what foods make up the unprocessed universe, and then gotten derailed by real life two days into the work-week. After years and years (and years) of succumbing to the siren song of convenience, I discovered the one thing that broke the pattern was when I had a fridge stocked with ready-to-go (and really delicious) homemade components to quickly assemble a meal. So for instance, a Sunday evening meal of roast chicken, braised kale, and roasted butternut squash and shallots could turn into simple meals for the rest of the week — chicken Caesar salad on Monday; a kale frittata on Tuesday; chicken and squash tortilla pie on Wednesday; butternut squash soup on Thursday; and garlicky kale pasta on Friday. Yes, each of those Reinvention Recipes takes a little bit of prep, but having the already-done Core Recipes staring back at you from the fridge will give you the edge you need to persevere with your unprocessed dreams throughout the week. Try it here with these two dishes. 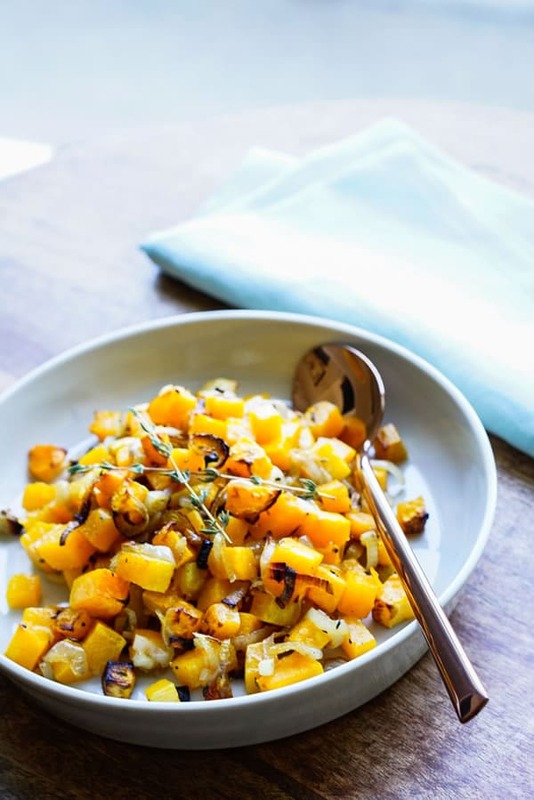 Make a double recipe of the Roasted Butternut Squash with Shallots. Then, after you’ve enjoyed it as a part of a meal, think about how you can use it as a starting point for another, entirely different dish, like Butternut Squash soup … or smeared onto pizza dough, or as a tostada topping. Let yourself go wild! …and if you want more inspiration, sign up for Cook the Seasons — and use coupon code UNPROCESSED for $10 off! 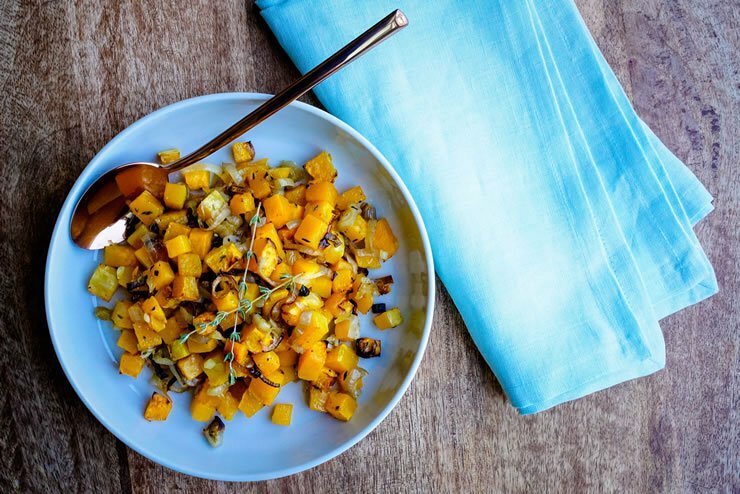 Simple, yet delicious use of butternut squash as an amazing way to draw out its distinct taste. Toss squash and shallots with olive oil, thyme, and a pinch of salt and pepper. Spread in a single layer (or close to it) in a heavy roasting pan. Roast for 25-30 minutes, stirring occasionally after the first 10 minutes, until squash and shallots are tender and caramelized. Remove from the oven, and discard thyme stems. 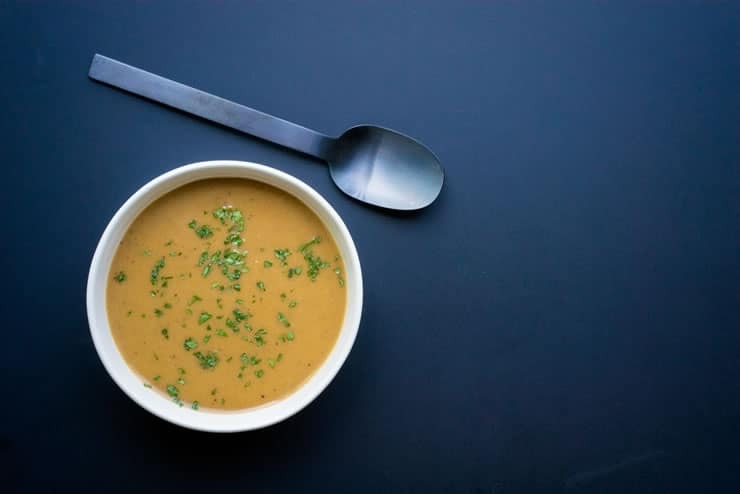 This smooth and creamy soup has the delicious taste of the unique butternut squash as you find yourself coming back for more. Heat olive oil in a large pot over medium-high heat. Add onion and a pinch of salt and pepper. Saute 5 minutes, until tender and starting to brown. Stir in squash, stock and spices. Bring to a boil, reduce heat, and simmer 15 minutes. Puree soup in batches in a blender or food processor until smooth (or use an immersion blender to puree it in the pot). Blend in yogurt. Adjust seasonings to suit your taste. Garnish with chopped parsley, if you like. This is awesome! I absolutely LOVE this way of thinking! Play the game, don’t let the game play you! I’m always looking for creative ways to eat healthier during the week when prep time is at a premium and non-existant by the end of week. And repurposing leftovers is truly the best, easiest, low stress way! It allows you to do the most prep before the week starts when you have more time and theoretically less as the week goes on. And my favorite thing about planning of any kind is you get out of the mental part of “what’s for dinner?” I’ve found it also make me more creative in all of meal planning! This idea is absolutely a winner. Key to surviving healthfully in today’s busy world.